final climb to the summit of West Kip! 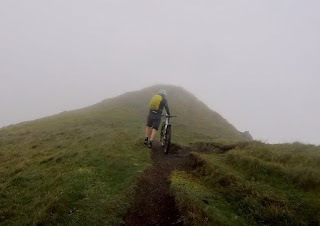 Its too steep to pedal now so it's hike-a-bike time now...onwards and upwards! Eventually we reached the top and set off into the mist for the descent where Barrie nearly came to grief right at the start as he took the right hand side to descend from! The dead roe deer I came across on Monday evening, which, by the look of it had been shot but not fatally and had run on before succumbing to its wound, no doubt whoever had shot it had no licence nor any love of wild animals either, I passed it on Tuesday night and at least some other wild animals had benefited from its carcase rather than the scumbag who'd shot it. 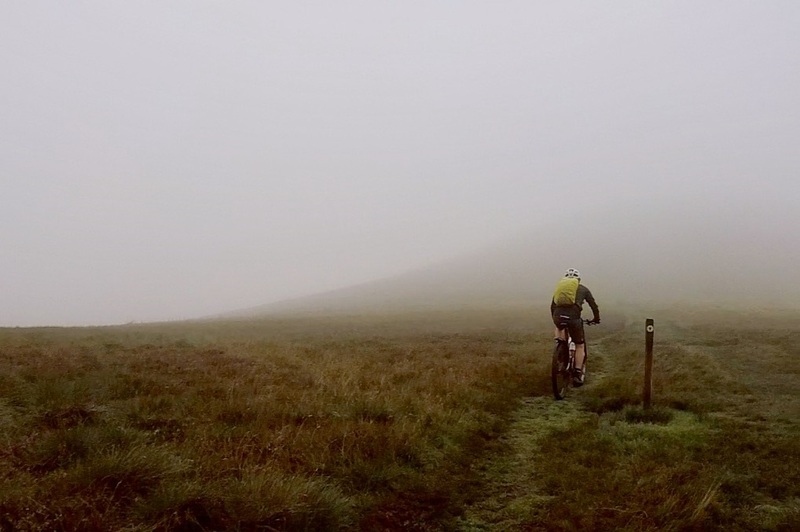 An adventure last Saturday morning in the mist and heavy rain as we pedalled along the Pentland Skyline, my cycling glasses proving worse than useless and Barries worn out tyres sliding on the wet grass and greasy track. This must go down as the slowest descent on record from Turnhouse Hill down to Flotterstone but at least we made it in one piece. The East Neuk of Fife and the path goes over farmland and past a herd of cows that Dougie mistook for bulls and fell into a ditch in his panic to avoid them! Barrie consults the map for inspiration! Anstruther's world renowned fish and chip shop was just too much of a temptation to pass by! Barrie said a rock jumped out and forced him to use the ejector seat! Eventually after 13 hours of blood (in Dougies case) sweat probably both of them, and tears,mostly mine as I waited for them at St Andrews, they reached the end at the Tay Bridge, where Barrie's dog, Rebus, was waiting to greet them. Barrie's dream which he's he's harboured for some time has been to bike the Fife Coastal Path from the Forth Road Bridge up to the Tay Bridge in the north of Fife. Dougie agreed to accompany him and I was back up crew with food, water and a change of clothing when needed every so often. They set off at 6.30am and after 13 hours and a few adventures, from upsetting a herd of cows to upsetting professional lady golfers (not really much difference there then) they eventually reached their goal with the weather alternating from bright warm sunshine to torrential rain and easy going bike tracks to soft sand and hike a bike in places, that's now been ticked off the bucket list, thank goodness my services as back up are not required for a while again, sitting around waiting is nearly as tiring as doing the actual ride.......well maybe not quite!